The Gran Amadores Apartments are only 200m away from the new Amadores Beach with a choice of bars and Restaurants. Situated on the flat with stunning sea views. Puerto Rico is only a 15-20 minute walk along the new seafront promenade. Gran amadores was excellent value for money, if you want five star accomodation then you pay for it. Excellent location, friendly reception and bar area staff. Take a kettle and iron then you only need to hire a fan 20 euros 5 returnable. Complex quiet, couple of euros to europa in taxi where you can find restaurants entertainment and arcades. Also puerto rico larger scale complex again couple of euros worth a journey. You can also use hotel facilites opposite gran amadores, had a wonderful english breakfast (buffet) mirador hotel. Lovely island, would go to gran amadores again, took my 8yr old son he was not bored! Apartments very good size , basic but very clean. Maids every other day. Situated close enough to the beach without a horrendous trek up the hills. Staff friendly and helpful. Entertainment basic but we didnt go for the entertainment anyway and it meant there wre no roudy crowds after midnight. Hope to go back next year. Small freindly and everyone seemed to get to know each other without being intrusive, lovely family holiday. Always sunbeds too and no 7am rush to put your towels out thank God! Review showed feedback as basic so we didnt expect much and were pleasantly surprised apartment provided all that you needed dont go there to spend too much time indoors anyway. Staff were all friendly no issues with building work although whilst it is going on not in the immediate vicinity. We went for a complete chill out and thats what we got. Great restuarants didnt have a bad meal once. Very quiet, overall, the entertinment not really our cup of tea but each to their own. No boom boom partying till earler hours complete bliss. Could have done with aircon although it was not a major problems they hire fans to you for a small charge that did the trick. If you want 5 star pay for it if not this is a real bargain. The two pools were great for kids, especially my cousin jordan taught me how to dive into the heated swiming pool on xmas day. Just back from Gran Canaria and had a great time! The apartments were clean and spacious! The maids were in every day apart from a thurs an sun! The staff were very helpful an pleasent. The food at the apartments was not too bad for snacks!! We stayed in the apartments 1 night and the entertainment was great, had a brill night wiv a quiz bingo and games, although it isn't like that every night! There is a dj there most nights doing a quiz, bingo an kareoke but not many people go an it's quite quiet!! The apartments are about a 20 min walk to the main centre but we never walked it was too warm!! The taxi's were only about 3 euros each way!! We personally thought the apartments where a bit far out for us but it was nice an quiet during the day so can't complain!! Overall had a great time an would recommend these apartments if u don't want to be in the heart of puerto rico!! Nice apartments. 2 Pools and beach view. Only 3 storeys high, great for the kids. We brought a brolly, we needed it as it was 30 degrees - hot. Jamie & Jordan had a ball playing water polo with all Scottish kids. This is the second time we have stayed in the Gran Amaradores. The accommodation is clean, bright and spacious. The staff at Scotch Corner were very friendly and gave good service as were the staff at reception. We have just returned from Gran Amadores on 27th August after two weeks away, myself and girlfriend (Both 19) and had a fantastic two weeks away! 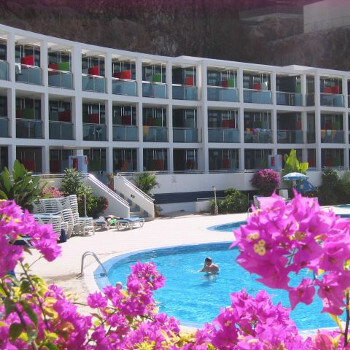 The Amadores throughout the weeks were always well cleaned every second day and apartment was spotless. Cheap food and drink was bought from the "Scotch Corner" bar in the apartments. Was mostly all Scottish apart from a few rooms taken by Spanish. All the staff were found to be very friendly and didn't have any hassle at all. Nice wee local shop within the complex for local shop. Would really visit back again next time! Only let down was no entertainment but wasn't a hassle as we got a taxi into Puerto Rico every night or you could walk. Also there is some building work going on but it wasn't much of a bother to us and we managed to still come and have enjoyed ourself so much! The hotel was pretty worn out and. The best was its location near the beach and with beautiful sea view and marvellous sunsets. The Pools were partly dirty and many of the ladders into the pools were broken. The rooms were spacious but very cheaply and moderately furnished. Just returned home from Gran Amadores unfortunately had to cut holiday short from 2 weeks to one due to illness. Apartments were in great location and although obviously clear building work was going on we weren't really bothered, and we had been warned in advance they were working near the apartments. Unfortunately I took ill on second night and never really felt better the rep Tracey was fab and got me and my friend back on an earlier flight. I'd def go back, only thing that put me off was pigeons drinking and washing in the pools, but I guess that happens everywhere! Just hope it didn't make me ill.